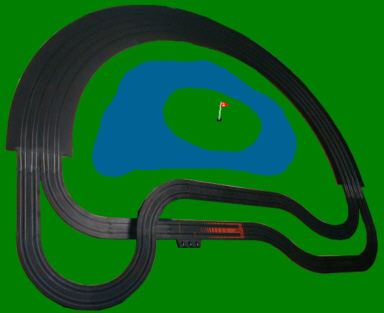 I can build just about any custom track section you may need. 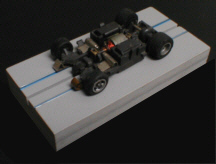 Any straight, corner or complex of corners. or used for a temporary circuit. to the ends of the custom pieces. any other section of standard track. in conjunction with Tomy A/FX track. 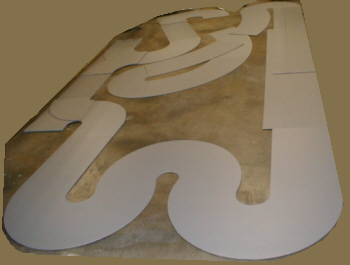 Click here to see a 21" radius corner that connects to AFX track. to fit inside Carrera's #1 turn for sale. Set-up block $14.99 (includes USPS 1st class shipping). 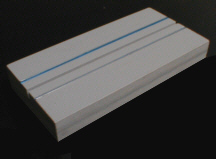 3/8" thick to help prevent warpage. Correctly identify this chassis and get a $1.00 discount.